The Cottenham Village Design Group provides a forum to give local people a voice in design, planning and development issues. 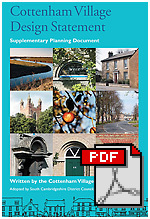 The Group publishes the Cottenham Village Design Statement, adopted by South Cambridgeshire District Council as a Supplementary Planning Document. The Design Group also make comments on planning applications in the light of the Village Design Statement, and holds meetings, talks and other events. PLEASE NOTE - this will be an important meeting which will determine the future of the group. For details and previous events see our events page. The Cottenham Village Design Statement was first publised in 1994. Since then both the village and planning legislation have evolved. The document has now been updated to ensure it remains relevant and effective. After public consultation, the revised Cottenham Village Design Statement was adopted by South Cambridgeshire District Council on 14 November 2007. Copies of the update document were distributed to all households in Cottenham. Please email us to join or to find out more.